The Boker Magnum 02SC743 Lil friend Micro can cut through just about anything with its 440 stainless steel blade. 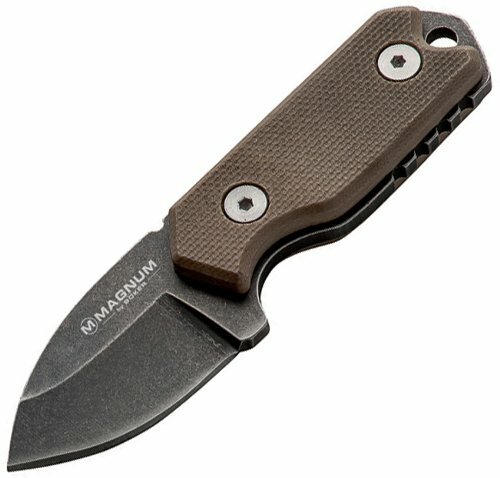 The compact, lightweight, sharp and multifunctional fixed blade knife features a drop point blade and tan G-10 handle. The Lil friend Micro offers a variety of carrying options, around your neck with a ball chain, in your pocket, or attached to your gear or belt. Includes a Kydex sheath. Blade length: 1- 3/8 in. Overall length: 3- 3/8 in. Weight: 1.3 oz. Limited lifetime warranty. The Magnum brand offers affordable performance, with attractive designs, impressive quality and an outstanding price-performance ratio.